NOTHING SCREAMS LIBERTY QUITE LIKE TAKING A STAND BEHIND THE FREEDOM ORDNANCE FM-9 BELT-FED 9MM UPPER. The receiver uses several inserts in high-wear areas made from heat-treated 4140 chrome-moly steel that has been nitrided for abrasion and corrosion resistance. 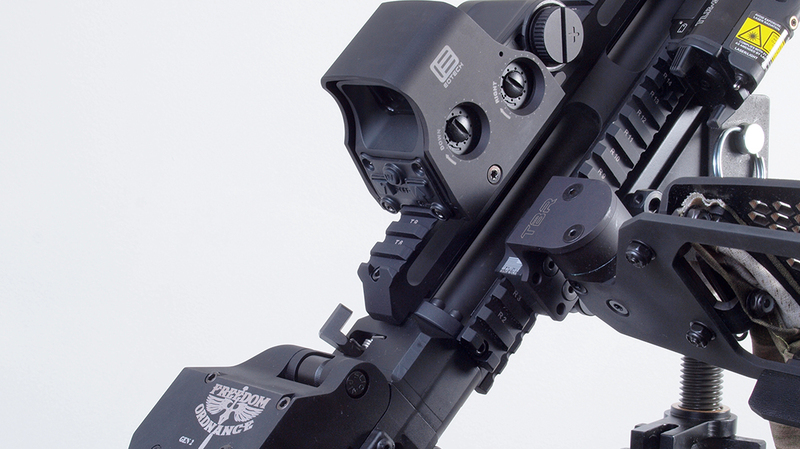 The Elite variant of the FM-9 comes with a quad-rail handguard as well as a quick-change barrel mount. 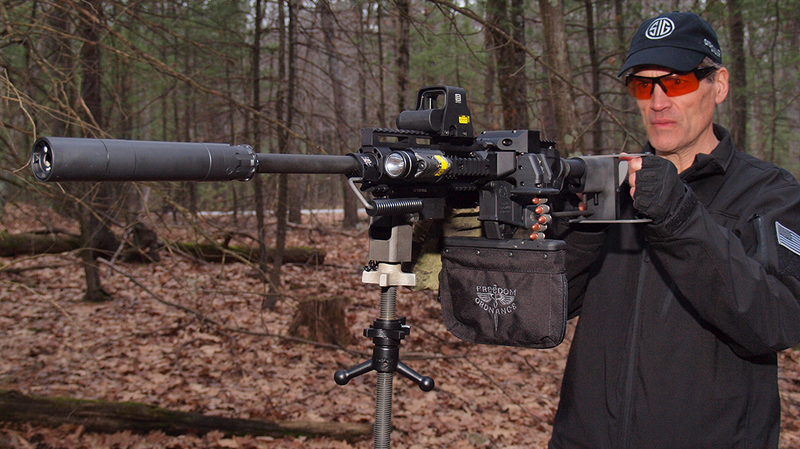 The author added a Rugged Obsidian suppressor and an EOTech XPS3-2 holographic weapon sight for testing. The disintegrating-link belt feeds from the left side of the receiver. 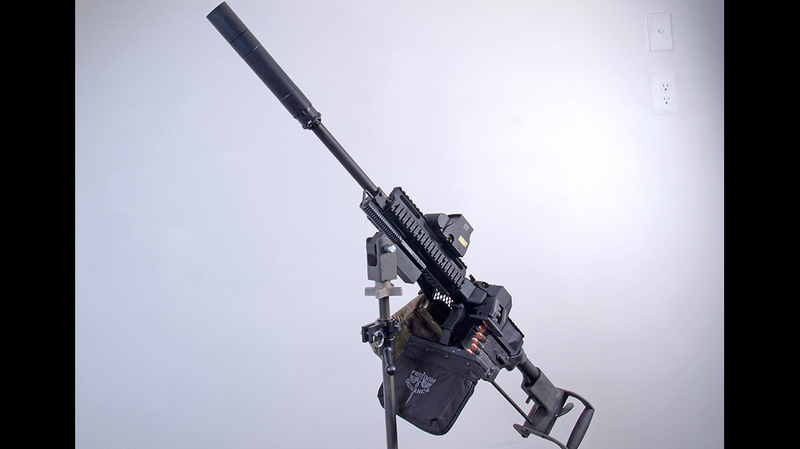 Adding the KNS Gen 2 Spade Grip and Firestorm Works Tripod makes the FM-9 resemble a heavy machine gun. Make sure you read the instruction manual before running the FM-9. 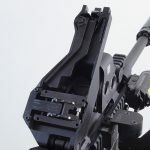 The top cover pivots upward like a larger machine gun, though Freedom Ordnance recommends loading the upper with the top cover closed. The gun industry is mature, and new product launches are usually product line extensions in which minor upgrades or enhancements are the only changes to an old-line firearm. They don’t generate much excitement. But a mature industry doesn’t have to be stagnant. Despite sales cycles that get distorted by political considerations, innovation and quality drive gun sales long-term. New and exciting products surface, but at unpredictable times. 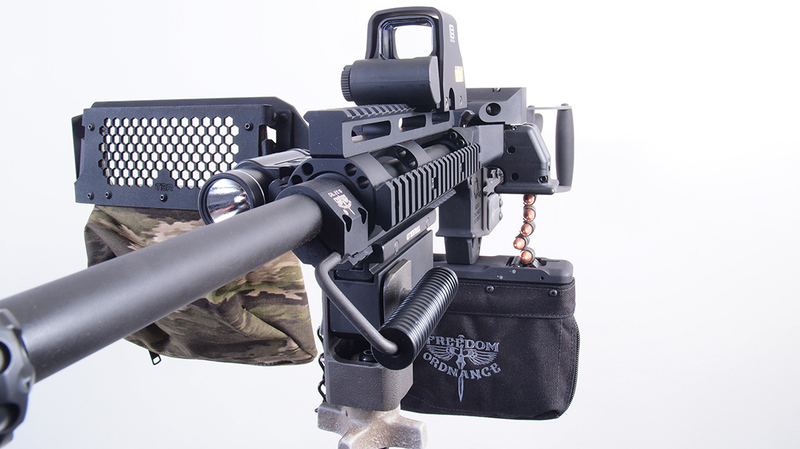 And the FM-9 belt-fed 9mm upper receiver from Freedom Ordnance is one of those products. 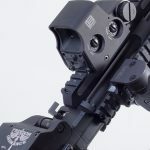 Freedom Ordnance was formed in 2015 to manufacture and market the FM-9, but the founding brothers are hardly newcomers. 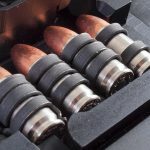 They each have 12 years of experience in firearms design and manufacturing, including inventing and patenting two distinctive adjustable gas operating systems for tactical shotguns. After they sold those patents, Michael and David Winge turned their attention to what many in the Class 3 firearms community have always wanted for an M16. Two prototypes and about eight months later, a first-generation FM-9 was born. This past year, Michael offered Tactical Life a tour of Freedom Ordnance’s plant near Evansville, Indiana. 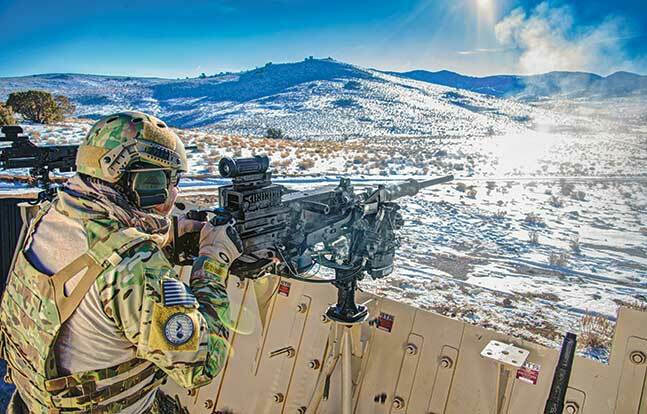 This is where the FM-9 and FX-9—an AR-platform rifle dedicated to Glock magazines—are made. I immediately accepted his offer and three weeks later was touring his modern, neat, well- organized and well-lit building. Hardly the back-of-house garage shop you might expect from a company less than three years old, Freedom Ordnance looks like an operation with much more manufacturing experience, with new CNC machines and a quality-control process that follows each part and assembled unit. Though Freedom Ordnance’s plant is obviously modern and efficient, I also noticed a strong work ethic and pro-Second-Amendment values throughout. Michael’s wife and father are involved in production, and Michael test-fires every weapon before it leaves the plant. This company isn’t afraid to be all American, and I felt welcome there. 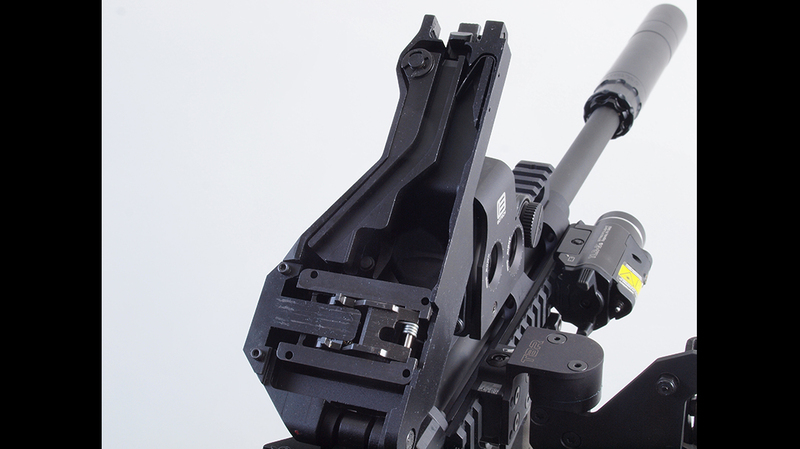 The FM-9 works with mil-spec AR-15/M16 lower receivers without any modification. 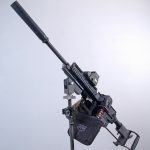 The FM-9 is blowback operated, fires from a closed bolt and feeds from a disintegrating link belt housed in a nylon bag under the gun. 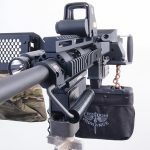 The reusable links are made of heat-treated steel, and the detachable ammunition bag holds 150 rounds. You can fill those links by hand. However, buying the belt linker, which loads 15 at a time, is money well spent. 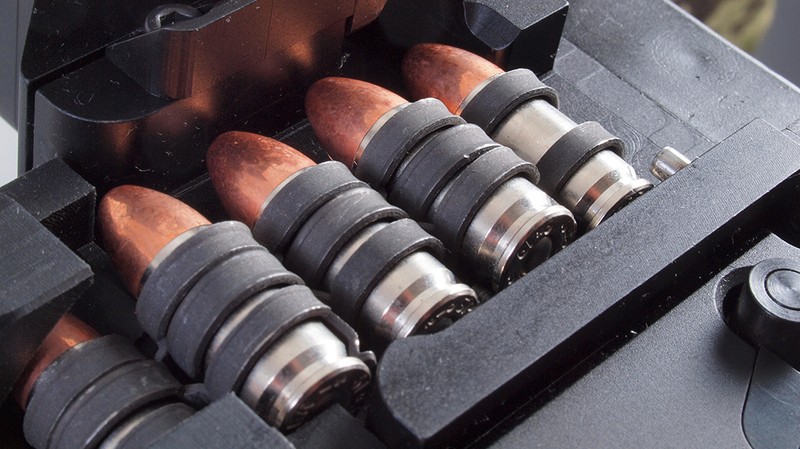 One of the FM-9’s best attributes is its preference for economically priced ball ammunition. Freedom Ordnance recommends (and my testing confirmed) that Winchester and Tula 115-grain FMJs shoot reliably, but cast-lead and lower-powered loads should be avoided. 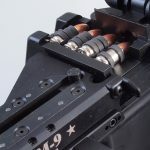 The FM-9 mounts to the lower receiver using the standard two pushpins, and the only additional step required to get it ready is to insert a block into the magazine well, which holds the ejector. The FM-9 functions on semi-auto and select-fire lowers, though slight modification might be needed to function with drop-in auto sears. The FM-9’s sturdy construction is evident in its unloaded weight of 7 pounds. 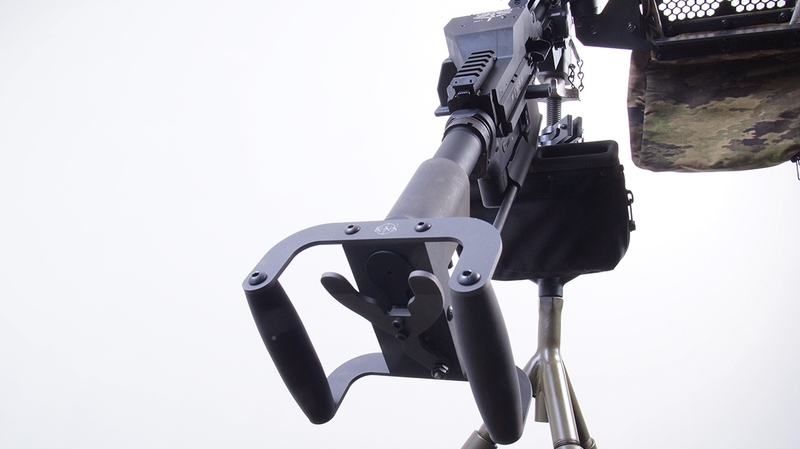 Adding a complete lower receiver, a holographic sight and 150 rounds of ammunition makes for a hefty package that almost necessitates a bipod or tripod mount. 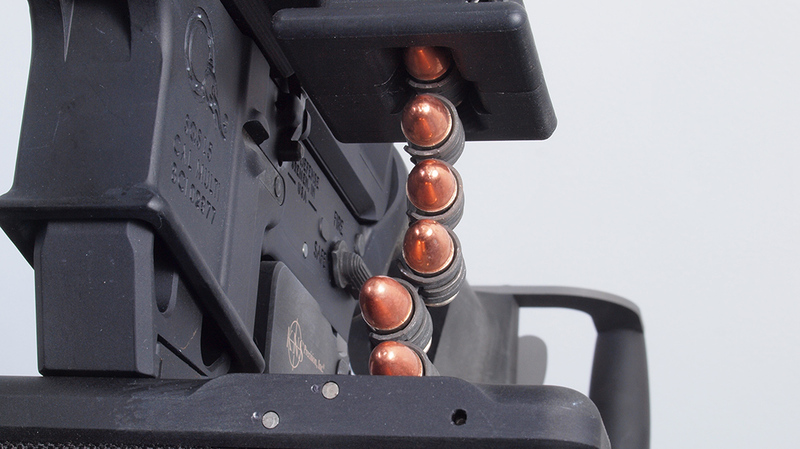 Because the FM-9 is belt fed, loading and clearing won’t be intuitive to people used to magazine-fed rifles, so be mindful to follow the instructions precisely or you could damage the unit. 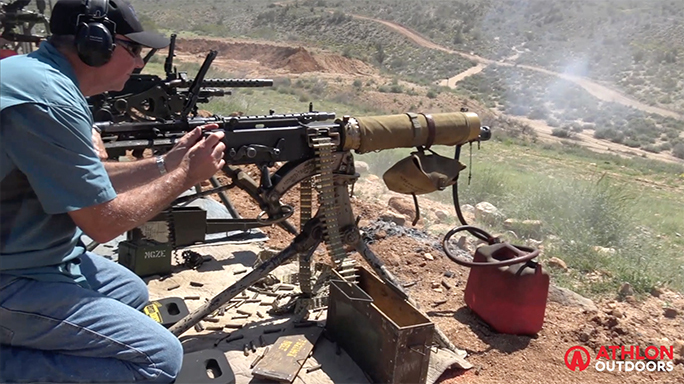 Fortunately, for those unfamiliar with belt-fed weapons, Freedom Ordnance’s clearly written operator’s manual and online videos provide must-have information and tips for new owners. Don’t brush them off and go it alone without viewing them. Freedom Ordnance makes two models of the FM-9: the Minimalist and the Elite. The latter is upgraded with a quad-rail forend and a quick-detach barrel mount. The company offers three barrel lengths for the Elite—6, 11 or 16.5 inches—making it work with rifles, SBRs and pistols with arm braces. 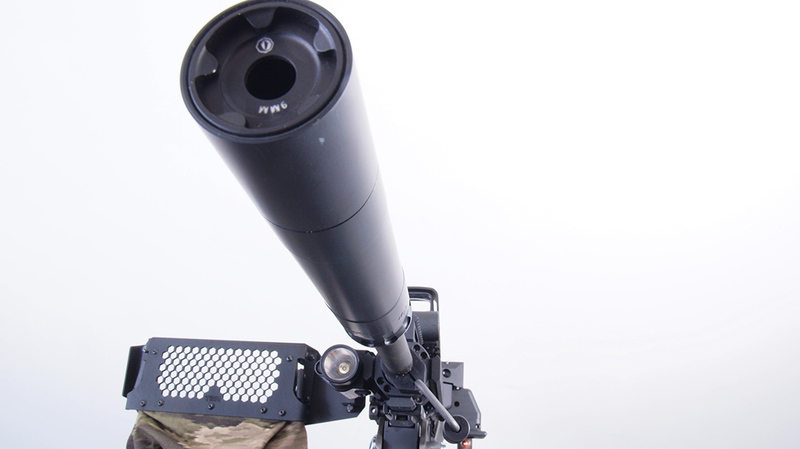 Every barrel has 1-in-10-inch-twist rifling and 1/2×28-tpi threading at the muzzle, and A2-style flash suppressors are included. 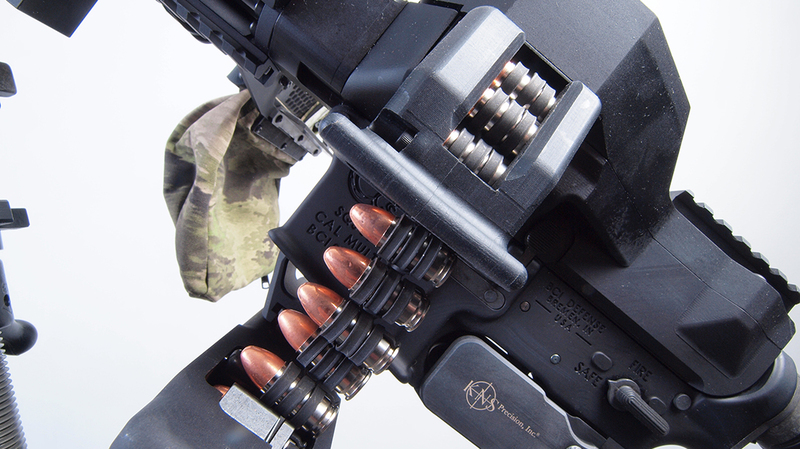 The barrel’s quick-change mechanism is reminiscent of the M249 SAW’s and works just as easily. To remove the barrel, press a lever on the trunnion, rotate the barrel a quarter-turn clockwise (using the carry handle to avoid a burn) and pull it forward. The FM-9 is robustly made yet carries an industry-leading warranty on the lifetime of the product, not just the original owner. The receiver is thick walled and, along with the quad-rails and top cover, is made from hardcoat anodized 6061-T6 aluminum. 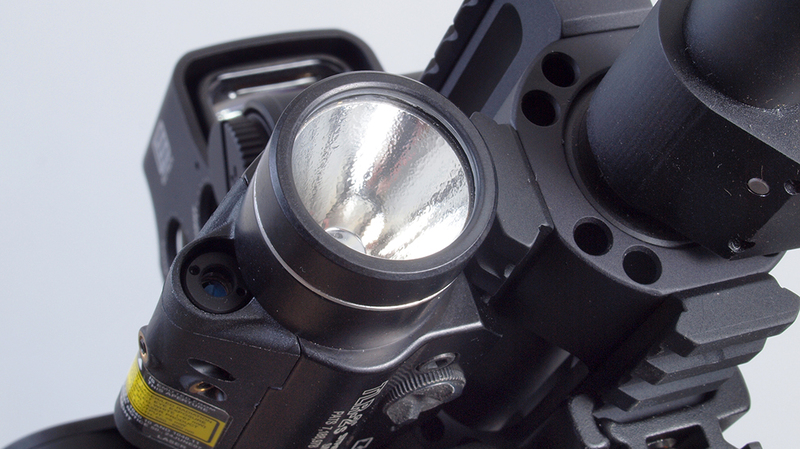 The top cover and receiver also incorporate numerous steel inserts in high-wear areas. 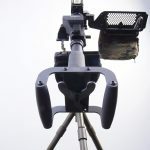 This includes the pawl; feed tray; bolt travel slot; and cam arm assembly; this transmits energy from the moving bolt to advancing the belt with each cycle of the weapon. Each of these steel parts, as well as the bolt and trunnion, are made from heat-treated 4140 chrome-moly steel that has been nitrided for abrasion and corrosion resistance. They are attached with hex-head screws, not rivets or press fits, allowing for easy replacement. 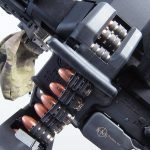 The barrel is also nitrided, which explains how one of the company’s test barrels still has serviceable rifling after firing 5,000 rounds over several full-auto sessions. Of course, I couldn’t leave well enough alone and had to add some accessories before testing the FM-9 on the range. Here’s what I added. Because the spade grip necessitates firing from a support, I attached the new Firestorm Works Tripod. 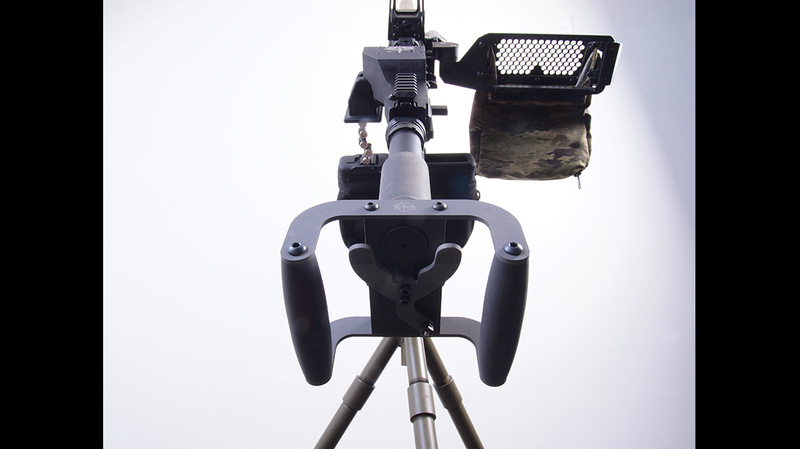 Sturdy and well made, this tripod comes in a military-style shoulder bag for easy field carry. 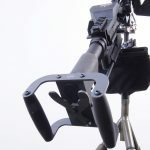 It attaches to the FM-9’s forward Picatinny rail and uses a large pull pin to secure it, making mounting and removal of the rifle quick and easy. Capturing your brass and reusable links is a time saver; Tactical Brass Recovery (TBR) makes models for ARs, subguns and belt-feds. 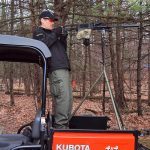 Designed for full-auto fire, the TBR brass catcher is far better than any other I have used. It captures the brass without being noisy like the old plastic-drum designs and keeps it from reflecting back into the ejection port. 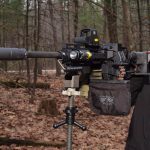 I tested a 16.5-inch-barreled FM-9 for accuracy by shooting at 50-yard targets from a benchrest using a GG&G bipod and sandbags. As I mentioned, I used economically priced ball ammo; the best group came with Winchester’s 147-grain WinClean BEB ammo. It measured just 1.13 inches. This particular ammo has proven accurate and reliable in almost every carbine I tested this past year. Shooting sub-1-inch groups at 50 yards in some rifles, this load easily outperforms any round in its price range. 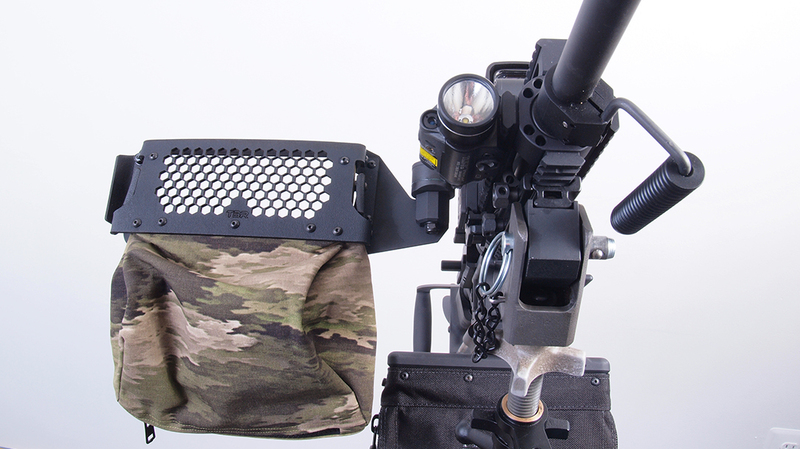 Its lead-free primer and enclosed base also keeps lead from accumulating in muzzle brakes and suppressor blast chambers. 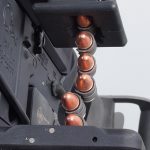 Empty brass and links ejected from the right side of the receiver, landing a few feet away or, when I used the TBR brass catcher, were 100-percent captured. The only problem I encountered was a loose fit between the FM-9 and the lower receiver I used, which was annoying but partially corrected with a rubber receiver wedge. 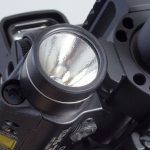 I tested the FM-9’s reliability in semi- and full-auto modes. 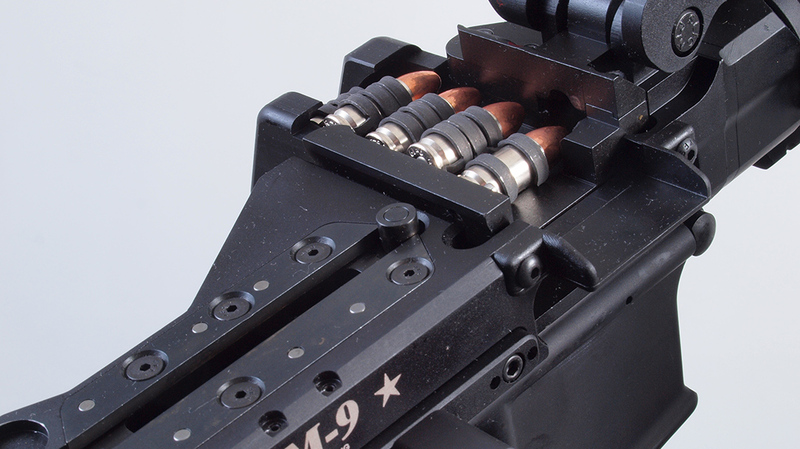 Because belt-fed arms require more energy to cycle the action than mag-fed models, the FM-9 performs best with hotter rounds. I found that Tula, Winchester and Independence round-nose FMJs were reliable in the FM-9. There were zero stoppages even when firing bursts in full-auto. I experienced two stoppages while shooting the WinClean ammo in semi-auto. However, its flat-nose bullet did not feed reliably in full-auto. The Remington 115-grain FMJs did not cycle the action about 20 percent of the time, and 115-grain plated reloads from U.S. Cartridge Co. and Freedom Munitions’ 165-grain HUSH were completely noncyclical, though these loads work well in my magazine-fed 9mms, and the HUSH is a specialty low-velocity load. As you can see, Freedom Ordnance has done its homework in recommending ball ammo for the FM-9 upper. Stick to those loads like the Tula, Winchester and Independence round-nose FMJs for your own range sessions. 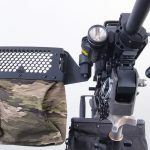 No difference in reliability or any significant change in point of impact was noticed at 50 yards while firing in suppressed mode with the Rugged Obsidian installed. 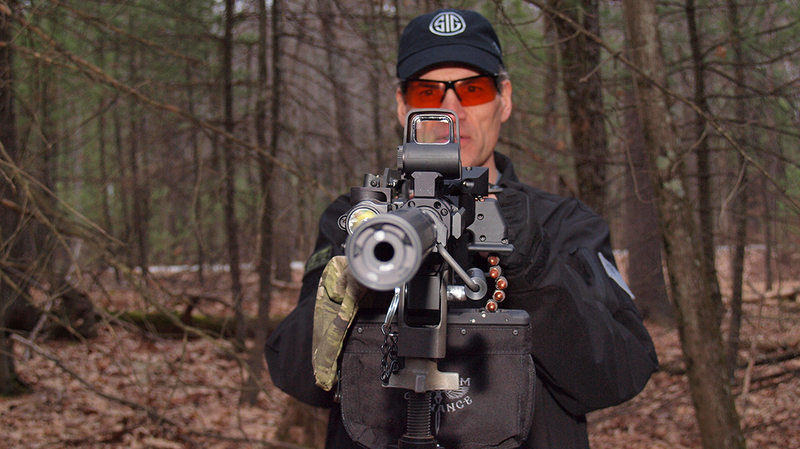 With the 16.5-inch barrel and firing the WinClean ammo, the Obsidian is quite effective. The FM-9 is unique, with tremendous appeal for commercial shooting ranges and gun enthusiasts who thought they had everything worth owning. This upper works well with reasonably priced ammo; the Elite model’s quick-change barrel increases its versatility for owners of full-autos and SBRs. 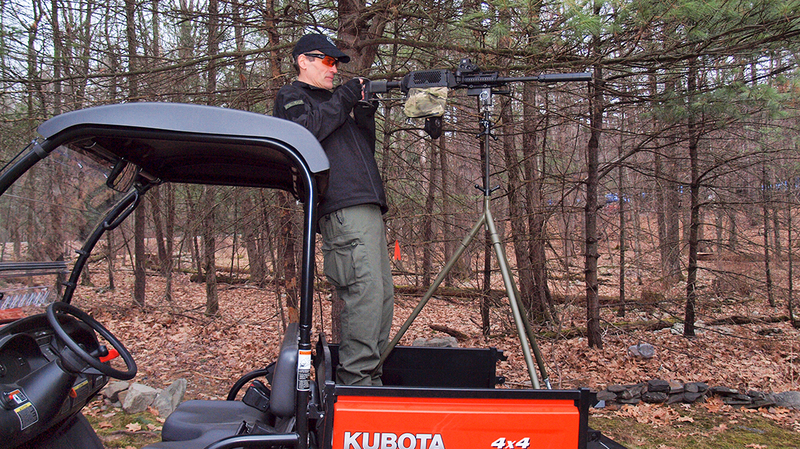 I can envision an M16 with an FM-9 mounted on an ATV to take on the ultimate jungle target course or set up on your “rural” back porch with steel targets arrayed across a field. But even for less imaginative uses on a semi-auto lower, the FM-9 performs well and is accurate with the ammunition it likes. Besides, it’s an outstanding piece to display in your den and gun room when decked out with your favorite accessories. *Bullet weight measured in grains, velocity in fps by chronograph and accuracy in inches for five 5-shot groups at 50 yards. 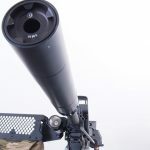 For more information, visit freedomordnance.com. 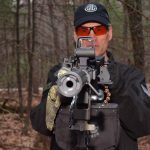 This article is from the May/June 2018 issue of “Tactical Life” magazine. To order a copy and subscribe, visit outdoorgroupstore.com.